THR is reporting Kenya Barris is teaming up with athletes-turned-producers Blake Griffin and Ryan Kalil for a new version of the 1992 sports comedy. Kenya Barris, the creator of ABC’s acclaimed comedy Black-ish, is teaming with Blake Griffin of the NBA's Los Angeles Clippers and Ryan Kalil of the NFL's Carolina Panthers to develop a remake of the 1992 sports comedy for 20th Century Fox. Barris will write the script for the project, which falls under his overall film deal with Fox that he signed in September. Barris also will act as a producer. Griffin and Kalil are producing via their Mortal Media banner, along with their partner Noah Weinstein. 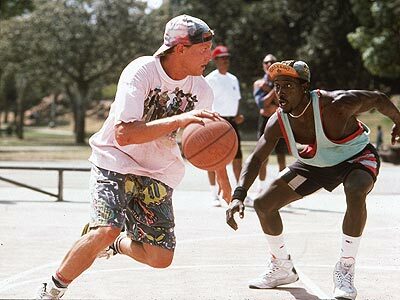 White Men Can’t Jump, written and directed by Ron Shelton, starred Woody Harrelson and Wesley Snipes as two street basketball hustlers who at first try to hustle each other, then team up for a bigger score. Also figuring into the equation is Harrelson’s character’s longtime girlfriend, played by Rosie Perez, whose dream is to appear on TV's Jeopardy! Griffin and Kalil’s Mortal Media is a relatively new venture but is busy building an active slate with high-profile titles. Among other projects the company is developing is a remake of The Rocketeer centered around a lead that will be black and female. The company also has an NBC comedy in development. Barris’ Black-ish is currently one of TV’s most acclaimed comedies, receiving recent Emmy and Golden Globe nominations (star Tracee Ellis Ross won a Golden Globe for her work on the show). On the film side, Barris is developing a remake of Shaft for New Line.